Making informed decisions is extremely important to me. But scrutinizing every item you purchase - from the brand of Soya milk in your morning tea, to that new winter coat or the ingredients in your favorite shampoo - can feel exhausting and overwhelming. With so many conflicting ideas and opinions about ‘doing the most good’, it’s easy for consumers to become confused and disillusioned. Like many people, I have moral, ethical and social viewpoints. I strive to lead a zero-waste life. I support Fairtrade. I adopt environmental friendly, sustainable principles and enjoy a vegan diet and lifestyle. I want to be a conscious consumer so I try to study the things I buy. And the truth of the matter is, sometimes the more you know, read and research - the better informed you make yourself - the harder it is to make simple decisions. Morals, ethics and social viewpoints can get tangled up and contradictory. Little Green Lives - Become a conscious consumer - how what we buy can do the ‘most good, least harm’ for the planet? Several years ago, I chose to adopt a vegan diet. I made my decision considering the benefits for the environment, taking a stand against factory farming/ mistreatment of animals combined with the well-researched health benefits. Animal agriculture is a leading cause of climate change. In the beginning I’ll admit I became complacent, assuming I’d made the ‘ultimate good’ decision for the planet. Then several years on when I began to scratch the surface, I discovered that simply ‘going vegan’ was not enough. For example the soya bean (a vegan staple) in its varying forms posed a dilemma. To meet growing demands, soybean plantations have expanded, contributing to significant deforestation to climate change. There is soil erosion and other environmental impacts to consider from the ever-increasing use of pesticides, not to mention the genetic modification, the treatment of small farmers and encouraged exploitation of workers. Now, Imagine you’re in the market for a new winter coat or jumper. What material should it be made from to ensure the least social and environmental impact? As a vegan I don’t want to purchase wool in view of the well-documented mistreatment of sheep on large farms. As an environmentalist I don’t want to purchase a synthetic fibre because of the chemicals used in its manufacturing and its inability to decompose once in the landfill. Wool (a natural fiber) is essentially a renewable resource, yet is produced by methane producing sheep, not to mention the volume of water and chemicals used in processing wool. You see, it goes on and on. Cotton is also a natural fiber, but non-organic cotton requires huge amounts of pesticides in the farming process. The polluted runoff enters aquatic ecosystems. Then there’s Polyester (a man-made fibre). Its production creates high levels of dangerous emissions. Made from petrochemicals, these synthetics are non-biodegradable. Nylon manufacturing creates nitrous oxide, a greenhouse gas 310 times more potent than carbon dioxide. So, short of making our own clothes, what do we do? We can research a little, inform ourselves, and trace the products we buy back to the source and know how they are produced. And we can also spend our money as if we are casting a vote. If we want certain practices to stop, or ensure we’re not contributing to them, then don’t buy certain items. Utilize your vote as a consumer: choose to avoid purchasing certain products linked to deforestation or harmful labor practices. We need to peel back the layers of greenwashing, consumerism and materialism to make choices that actually do the most good for the world and the environment. Going into the holiday season how can you feel good about the choices you make, so you can eat, buy and use items relatively guilt free? Zoe Weil developed the concept of MOGO, short for ‘most good’. She describes the principle of applying the 3 I’s: inquiry, introspection and integrity to our life choices. Who or what was or will be harmed or helped by this choice? Introspection is simply understanding what matters to you. Finally, we must commit to living with integrity. And choose to behave according to our values to the greatest degree possible. So here is how I apply these ideas to our lives. I ask: do we really need this? Consuming less is the single most important change to make. There is currently a trend to consume a lot for a little, getting something for nothing essentially. Buying junk we don’t really need. If we change that behavior, there'd be a lot of benefit to labor and production practices. And a lot less garbage generated. I ask: can this be bought second hand, swopped, or can I make it? And if it’s no no and no, then I take the time to read labels, do some research and then stick to the brands I trust. When and where I can, I shop locally and support farmers’ markets and artisans. I shop in stores where the owners have done the thinking for me, and discover local brands. Organic cotton is always an improvement to conventional cotton: it saves lives, is better for the environment and better for farming communities (look out for the Global Organic Textile Standard (GOTS) logo/ label). Clothes made in your country of residence may go a long way to ensuring Fairtrade. Let’s strive to inform ourselves, to do what we can as individuals and families. If we can all consume less and vote with our purchases (and by not purchasing), we can catalyze real change. The earth will thank you for it. 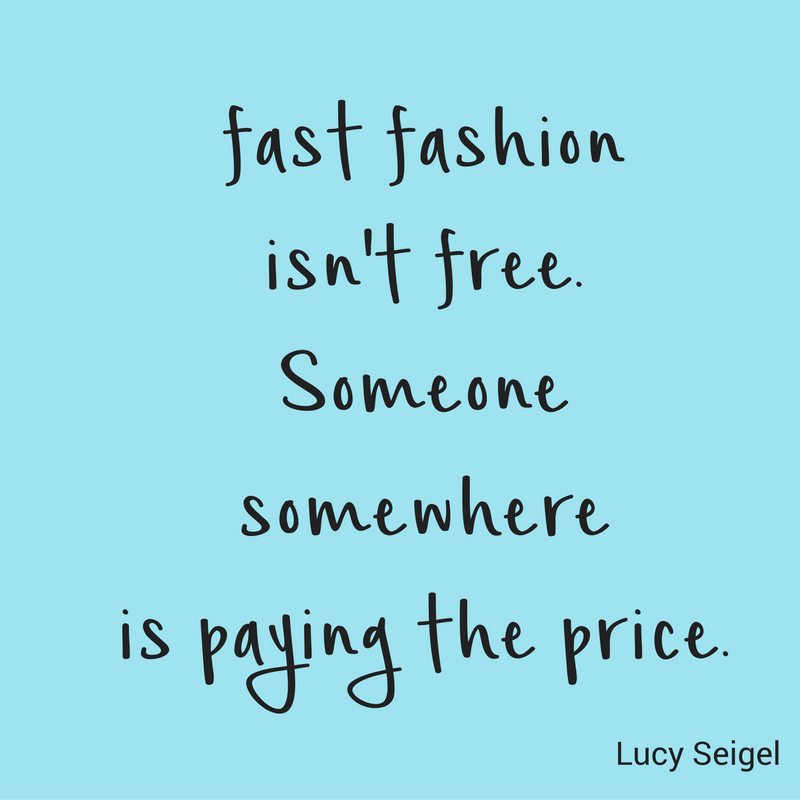 If consuming less in terms of clothing/fashion is of interest to you check out this post about the benefits of a capsule wardrobe. How to keep Christmas simple, reduce stress, expense and garbage, and have yourselves the best Christmas ever.